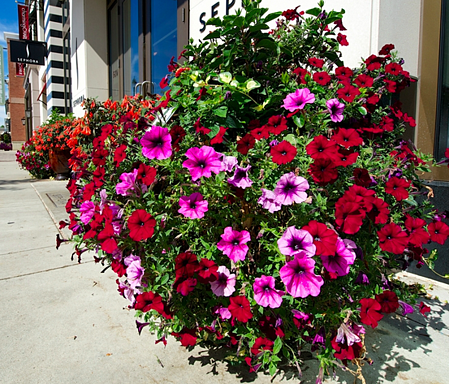 Container plantings are a cost-effective, big-impact way to draw attention to the entrance of your commercial property. They mark an entry, act as a test garden for new plants, give you the flexibility to change plants each season, and offer opportunities to be creative with interesting planters and bold plant arrangements. You can try new things in a container, and there’s no commitment, like planting in a landscape bed. 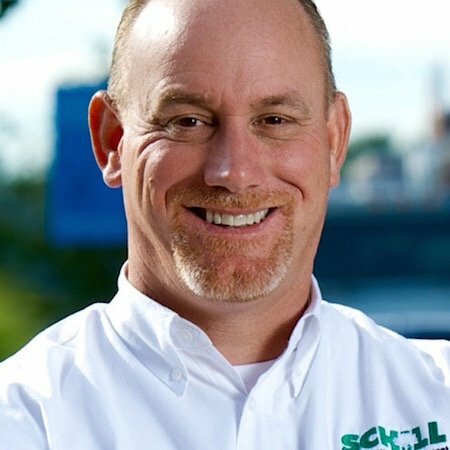 Of course, there are a few key considerations to keep in mind when choosing a planter and planning what will go inside. First is size. Think: proportion and presence. How large is the entrance, and the entire building for that matter? A gallon-sized pot in front of a corporate headquarters makes a weak impression—the entrance needs a lot more pot and plant. On the other hand, a planter should not overwhelm an entrance or hinder accessibility. Also, there are the planter contents to consider, and the balance within the container: height of plants, color variation, textures and so on. The eye should be drawn up, down and around the planter for a complete visual experience. For example, you wouldn’t want a planter with only marigolds or one specific plant. Mix it up. As for plant combination, containers offer commercial property owners the ideal opportunity to be adventurous within boundaries. You can test a new plant, try out a daring color (Pantone named Marsala the 2015 color of the year—so why not try it? ), and experiment with combinations. Planters are the perfect laboratory. You can unbutton your usual style and try something new without spending the investment on an entire landscape bed. 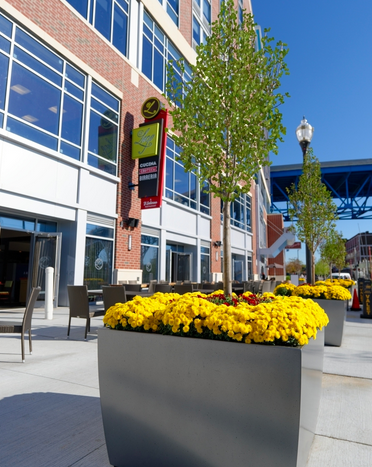 Here are four ways that planters can make an immediate statement on your Northeast Ohio commercial property. The entrance of your commercial property is, by nature, a focal point. All eyes are on the entry. You make a distinct impression when you mark the entrance of your commercial building, whether a retail establishment or office, with a vibrant, interesting planter brimming with colorful blooms and textured plants. For one, you show people that you take the time to care for your property, and you want to welcome those who visit. Also, the entrance is an opportunity to make a statement. You can define your style by the type of planter you choose—and there is a range of materials, from fiberglass to reclaimed wood. Planters are a perfect opportunity to try out the latest plant varieties and to incorporate new colors into your landscape palette. Containers act as temporary landscape beds: You can test new types of plants without committing to putting them into the ground. You may decide that you like a variety in your planter and want to incorporate it into more permanent landscaped spaces. Use your containers to experiment—they’re an open invitation to be bold. Keep your Northeast Ohio landscape relevant and updated all year long with decorative planters that change with the season. You can easily switch out the material inside containers—again, they act as mini landscape beds that give you the flexibility to immediately infuse your property with summer blooms, fall color and holiday arrangements. There are times of the year when the landscape can feel dull—like during mid-summer when commercial properties’ focus on keeping grass and plants watered and looking healthy and later in the fall when the thrill of pumpkins and mums are gone and snow is on its way. Because planters are essentially mini garden beds that you can quickly change out and refresh in a day, you can infuse entrances with fresh color and style. 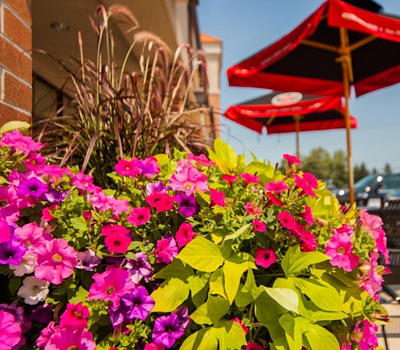 Container plantings are the most cost-effective way to inject your commercial landscape with vibrant colors, new plant varieties and seasonally appropriate plant arrangements that make a statement at an entrance. Let’s talk more about the creative opportunities planters can represent for your Northeast Ohio landscape. Call us any time at 440.327.3030, or fill out this simple contact form and we’ll get in touch with you.